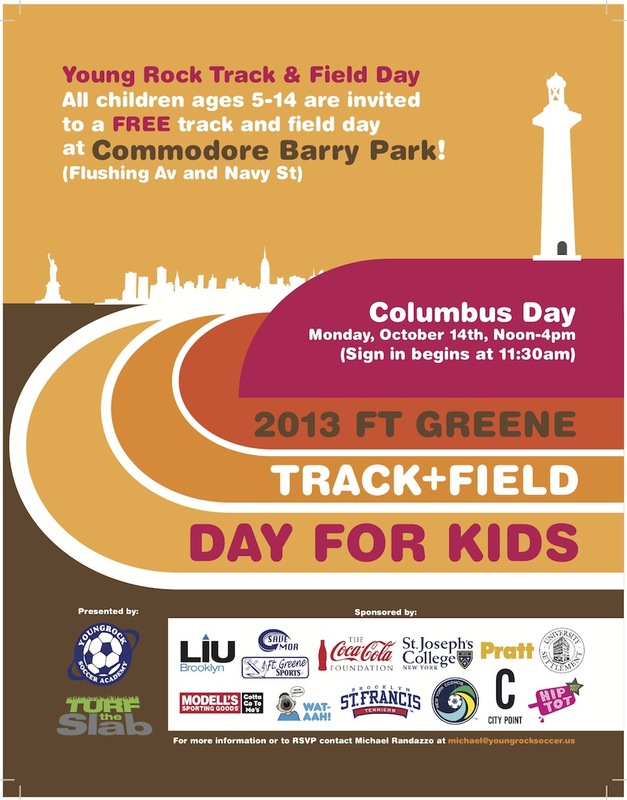 Columbus Day Plan: Fort Greene Track & Field Day for Kids!!! Turf the Slab is proud to be teaming up with Young Rock Soccer Academy to host the second annual Track and Field Day for Kids at Commodore Barry Park (Flushing Avenue and Navy Street) on Columbus Day – Monday, October 14 – from Noon to 4pm! Come join athletes from LIU Brooklyn and Pratt Institute, as well as the NYPD 88th Precinct, for a great afternoon of free fun and fitness. Bring the whole family out for a fun-filled afternoon, and a glimpse of Commodore Barry’s incredible potential to be a flagship public sports park for the entire Fort Greene community. All are welcome. We look forward to seeing you there! Sign the Turf the Slab Petition! Let’s End Local Turf Wars!